As big as a luxury yacht and almost as opulent inside, the QX80 is Infiniti’s answer to the Cadillac Escalade. It’s built on a full-size truck frame and powered by a 400-hp 5.6-liter V-8 with a seven-speed automatic; rear-wheel drive is standard and all-wheel drive is optional. The QX80 can accelerate briskly and tow up to 8500 pounds with standard seating for seven and eight optionally. In terms of quiet and comfort, it matches its competitors; when it comes to price, it is often cheaper. 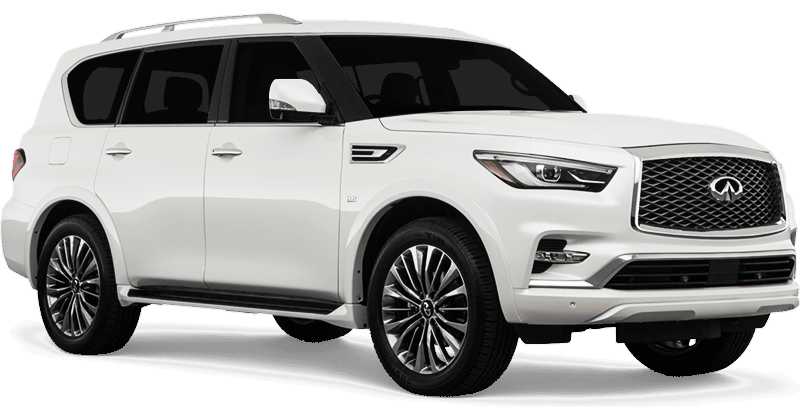 Infiniti launched the QX80’s predecessor, the QX56, when environmentalists were torching Hummers and energy experts claimed peak oil would dry out the world’s reserves within decades. During the 2004 model year, its first, gas prices crested at more than $2 per gallon, prompting more predictions that big SUVs would soon be extinct. Exactly none of that happened. Since Infiniti renamed the second-generation QX56 as the QX80 for 2014 (and then refreshed it for 2015), sales of luxury SUVs and crossovers have been on fire. For 2018, Infiniti has updated the QX80 a second time. After driving it in Charleston, South Carolina, we’d suggest—no surprise, given its age—that it may still need a few more tweaks. While the QX80 keeps its imposing presence, senior product manager Anand Patel admits that too many customers “could not get over the styling.” He’s talking about its brutish face that was part tractor-trailer, part 1930s-era Chrysler Airflow. By raising the headlights 3.9 inches, slimming their openings, toning down the thick chrome grille, and revising the entire lower fascia, Infiniti designers looked to mimic the gorgeous Q60 coupe and “get it to work on this large SUV.” We think they did a good job. Head on, the QX80 has become a handsome fellow. At the rear, a widened chrome strip connects new LED taillights, although the bumper-mounted incandescent turn signals are the one odd disconnect. The hulking 22-inch wheels (20s are standard), high step-in height, and lofty greenhouse carry over. Three new or revised colors are available, all at extra charge. Moonstone White is bright and pearlescent, Mineral Black adds some copper sparkle in the dark, and our favorite, Champagne Quartz, was said to be inspired by ancient French caves.